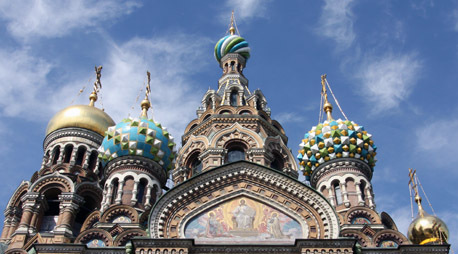 St Petersburg is justifiably one of the busiest and most popular cruise destinations in northern Europe. The city has just reported a record number of visitors in July – 150 ship days (most stay overnight) and 110,000 passengers. On the second day of my visit last week there were no fewer than eight ships in the beautiful Baltic city. At the modern cruise terminal Saga Sapphire was joined by Celebrity’s Constellation, Costa Fortuna, MSC Poesia, Pullmantur’s Empress, and Phoenix Reisen’s Albatros, while moored on the banks of the River Neva were the clipper Star Flyer and Columbus 2, the former Insignia of Oceania’s fleet, now operated by Hapag-Lloyd. With its stupendous palaces and cathedrals, gleaming spires and glistening domes (such as the Church on Spilled Blood (above), St Petersburg deserves its popularity – but it does not always extend a warm welcome. Immigration and customs procedures are less stressful than they used to be, but it is still the case that cruise passengers must book official ships’ excursions to go ashore unless they have obtained individual tourist visas – which can cost almost £100 each and must be obtained before departure. A British company is now exploiting a loophole which might challenge the cruise lines, offering excursions by ferry from Helsinki which give two nights in St Petersburg with no need to acquire a visa. The deal, put together by BAway involves return flights from London to Helsinki and overenight travel each way on the Russian St Peter Line ferry Princess Maria. The vessel, chartered from Danish-owned DFDS Seaways, has five restaurants and the package includes buffet dinner with beer and wine included. Once in St Petersburg, a shuttle bus provides transport from the port into the city centre and there’s a choice of central four-star hotels available. The deal, from £479 per person, is available all year round – unlike cruises which visit only during the summer months – although one exception is Fred Olsen’s Black Watch, which will be in St Petersburg for a day during a Christmas Markets cruise in November. Both pictures show the magnificent Throne Room, or St George’s Hall. The first was taken during a morning excursion two years ago when hundreds of other visitors crowded into the space. Below it is the same view last Wednesday evening. Not a single visitor obscured the view.